Growing up in Mississippi, Graduate School Dean Emeritus Robert S. (Bob) Sowell didn’t have many opportunities to travel. But during graduate school, first at Kansas State and then NC State, he was able to visit cities around the country, presenting his research at professional conferences. He recalls a trip to a professional conference in Miami Beach that he took as a master’s student. While working on his Ph.D., he presented at a conference in Detroit. Even when he was a faculty member, Sowell said that many of his family’s vacation trips revolved around travel to his professional conferences. Now, Sowell and his wife Suester have established Robert and Suester Sowell Graduate Student Travel Fund, an endowment that will help graduate students pay for travel to present papers at professional meetings and conferences. The Graduate Student Association at NC State offers travel grants to graduate students in the spring and fall semesters. But the grants don’t help everyone. Desiree Unselt, who was formerly the GSA’s vice president for academic affairs, learned the grants were not available to GSA officers. Fortunately, Unselt applied for and received a student travel grant from the Graduate School, allowing her to travel to Switzerland for a seven-day conference on the Biology of Aging. She is studying quantitative genetics and aging. “Desiree was a great inspiration for giving more students the opportunity to travel,” Sowell said. Sowell earned his doctorate in biological and agricultural engineering at NC State, as well as a bachelor’s degree from Mississippi State University and a master’s degree from Kansas State University. He served in the Air Force after completing his doctorate in 1967, and continued his service in the Air Force Reserve, retiring at the rank of colonel with 34 years of military service. 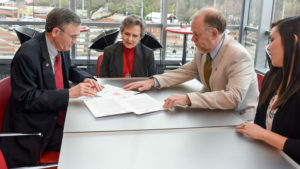 He began his career as a faculty member in NC State’s biological and agricultural engineering department in 1970 and was named associate dean of the Graduate School in 1991. He became dean of the Graduate School in 2000, a role he served in until his retirement in 2006. Upon his retirement, he was recognized with the Order of the Long Leaf Pine by the state of North Carolina. In 2015, he was persuaded to return to the Graduate School briefly as interim associate dean. Sowell was instrumental in implementing NC State’s Graduate Student Support Plan, which provides tuition and health insurance to graduate students working as teaching and research assistants and fellows. Since the inception of the GSSP in 1997, graduate enrollment at NC State has increased by nearly 70 percent. More than 21,000 graduate students have benefited from the GSSP, now a $50 million enterprise. While serving as dean, Sowell took a six-month scholarly leave in 2003 to serve as dean-in-residence for the Council of Graduate Schools (CGS), a higher education association in Washington, D.C., whose mission is advocacy for and best practices in graduate education, After retiring from NC State, he returned to CGS, serving eight years as vice president for programs and operations. Graduate education wasn’t the path that Sowell predicted for himself when he joined the faculty of NC State. Since you served as dean of the Graduate School, how has graduate education at NC State changed? When I returned to the Graduate School as interim associate dean in 2015, I found stronger support for graduate education at the university’s central administration level. During my tenure, we had struggled to get the Graduate Student Support Plan fully funded. Another thing that was just starting when I was associate dean were the professional development programs for graduate students – we offered Preparing the Professoriate and research ethics. But there’s so much more going on now. And I hadn’t really thought about professional development as a recruitment and enhancement tool, but students are looking around at other universities and what’s being offered. So it’s important to have these resources to keep us competitive. What attracted you to NC State for your Ph.D. in biological and agricultural engineering? At the time I did my undergraduate work, most of the faculty in bio and ag were getting their Ph.D.s in the Midwest. NC State was one of the first southern universities to offer a Ph.D. in BAE. I read about the faculty at NC State and the work that they were doing, and I thought this was more what I was looking for. The focus of my research in BAE was the application of systems analysis tools and techniques, such as computer modeling, optimization and simulation, to improve the efficiency and effectiveness of agricultural production and marketing systems. I developed computer models to study the need and availability of water for agricultural production in North Carolina. I also worked with the N.C. Department of Agriculture and the U.S. Department of Agriculture’s Agricultural Marketing Service on tobacco marketing systems. What was your role with the Council of Graduate Schools in Washington, D.C.? At the Council of Graduate Schools, I was vice president for programs and operations. So I was responsible for working with member institutions – we had over 500 U.S. member institutions, along with several international institutions. We had several grants from private foundations, as well as the U.S. Department of Education and the National Science Foundation that I helped administer. We had grants to look at completion of Ph.D. programs. We also offered programs on research ethics and administered the professional master’s programs – terminal master’s programs to make individuals more competitive in the job market. Before I left, we had also begun looking at the issue of student loans. We were able to help students to make better decisions to reduce amount they needed to borrow. I love the picture of Dr. Sowell and his wife. I have enjoyed working under his leadership while he was the Dean and Interim Associate Dean. What a great opportunity for graduate students to have this travel fund available for them. I am proud to say I had him as a professor in BAE, what a generous and worthwhile thing to do! What a wonderful thing to do, and how perfectly characteristic of Dr. Sowell! He was always so generous with his time, and his highest priority was always what was best for the students. Bravo, Bob! 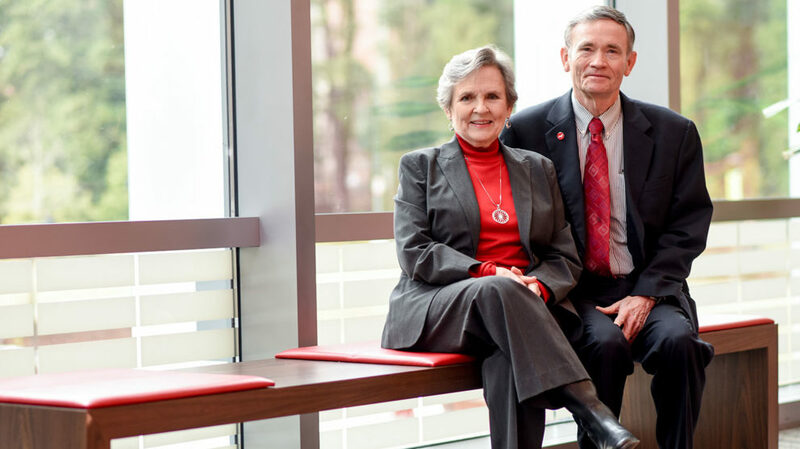 Bob and Suester, I was so pleased to see your pictures and learn about your continuing dedication to NC State and its students through your Graduate Student Travel Fund. You two always do the right thing in your gracious and sincere way in friendship and helping others as noted during our time together as graduate students at NC State and continued to now. A wonderful 50 plus years. Thanks!